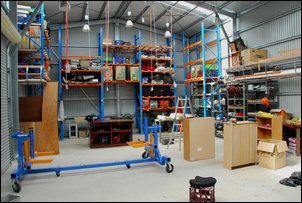 In a workshop – home or otherwise – the efficient layout of the power and light is of great importance. Here’s how it was done. The internal double power-points are not distributed evenly around the periphery of the shed but instead are located more densely where machine tools will be placed. The wall power points are mounted on rectangular pieces of polypropylene (cut up kitchen chopping board) screwed to the top hat girts. The hanging power-points (that experience shows will be among the most frequently used of all the power-points) are expensive but very useful. Suspended on long chains, they avoid the requirement for extension cords to run across the floor and are easily accessible, even with a lot of stuff mounted against the walls of the shed. They are placed 200cm above floor level – high enough not to be walked into, but still low enough to be easily reached. The wall-mounted power-points are wired in two circuits, each protected by a 20 amp combined safety switch circuit breaker (RCD / MCB). The 15 amp power point has its own 16 amp safety switch circuit breaker. The external and hanging power points are wired into another 20 amp breaker. This gives four power circuits, each with its own RCD / MCB. All power wiring is in 2.5 square millimetre copper cable. In my previous 14 x 6 metre home workshop, I used 12 suspended HID lights, each running a 150W metal halide globe. These were switched in two groups of six. The choice of these lights was made after experimenting with a variety of light sources. In addition, I used three suspended 48W compact fluorescent lights – these were used when instant illumination was required (the HID lights take some time to come up to full brilliance), and when less intense illumination was needed (like when I just wanted to get something from the shed at night). This approach worked extremely well, the HID lights giving a measured illumination of over 500 lux right through the workshop. 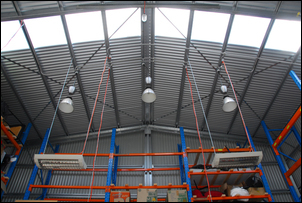 I therefore decided to use a similar approach with the new workshop – that was easy to do, as when I moved house, I kept all the HID lights! This time, for the lower level lighting, I went for two 20W compact fluorescents that feature inbuilt diffusers. In addition, I placed a twin 500W externally mounted floodlight aimed at the yard. The HID lights, wired into place with 2.5 square millimetre cable, run circuit protection comprising a 16 amp RCD / MCB. These lights are switched in two banks of six. The internal compact fluorescents, and the external floodlight, are connected with 1.5 square millimetre cable and are operated via two switches. These are wired to a single 10 amp RCD / MCB. Where I live it gets (for Australia at least) cold in winter. However, it is difficult to heat such a large volume (around 500 cubic metres) that lacks any kind of insulation. So I chose to not heat the volume, but to heat only me. To do this, I used three suspended radiant heaters. These are each 2.2kW, three-bar designs that I picked up for $20 each at a second-hand shop. With a good clean (requiring disassembly), the reflectors came up beautifully and with a 2.2kW output (over double a conventional single bar radiator) they pump out plenty of heat. A fourth I decided to keep as a portable heater – the idea is to mount it on a solid, tall stand so that it can be moved around as necessary. 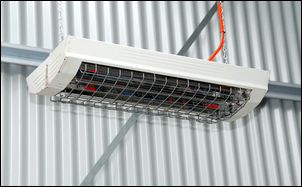 The heaters are wired into place with separate runs of 2.5 square millimetre cable, and are switched with three switches. They are wired to three 16 amp RCD / MCB units. 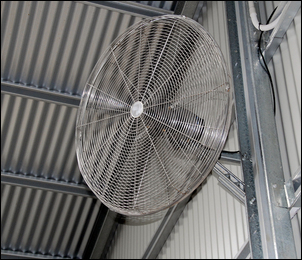 I mounted a large oscillating fan high on one wall. This is fed power from a socket switched from the main board. The socket is wired into place with 1.5 square millimetre cable. 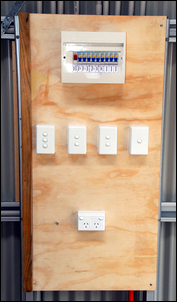 The circuit breaker board, all the switches and one of the double power points are mounted on a single piece of thick plywood located next to the personal access door. This makes it easy to switch everything off as you leave the workshop. The plywood panel is hinged on one side, allowing it to be swung open for wiring changes. · Buying goods second hand. For example, the powerful exterior floodlight was bought at a garage sale for $20 and needed only to be mounted on a bracket. · Buying most of the stuff (power points, conduit, cable, etc) from an electrical wholesaler. I used Kalmarc Electrical Industries, Unit 3 / 191 The Horsley Drive, Fairfield NSW 2165, phone 02 9726 3111. To give you an idea of price relativity, from this wholesaler a length of conduit was about 25 per cent of the cost being charged by my local hardware store. That certainly made the 450km round trip to the wholesaler worthwhile! The main parts used in wiring the workshop are shown in the following table. A major issue with wiring such a tall shed is access. The conduit runs on the walls could be done using a tall extension ladder, but the roof wiring required the hiring of a 4 metre scaffold – it was simply too dangerous to work on a ladder when you needed both hands free. The hire of this scaffold cost $360. 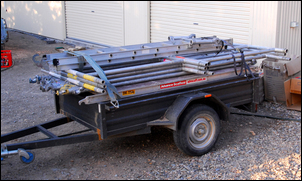 Note that the disassembled scaffold can easily be fitted on a normal car trailer (pictured). In terms of time and cost, the electricals formed a major component of the total workshop effort. However, the ease of use of the workshop, and the ability to work at night, make it worthwhile! Minuses: It takes a long time to do cable and conduit runs when working high on a scaffold. The Surprise: Shop around and save 75 per cent in electrical parts prices!